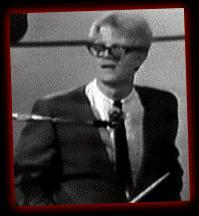 Pepys, John "Stumpy" (1943-1969): David and Nigel met the tall, blond geek in 1964 while touring as members of the Johnny Goodshow Revue. At a Southampton pub then known as the Bucket (now the Bucket and Pail), the boys jammed with the bespectacled drummer, nicknamed "the peeper" and then a member of the Leslie Cheswick Soul Explosion (now Les and Mary Cheswick). The three men would go on to form the Thamesmen and later, with Ronnie Pudding and Denny Upham, Spinal Tap, which played its first gig in December 1966. Pepys would die in a bizarre gardening accident shortly after the release of the bands third album, "Silent But Deadly." (IST) Nigel: "It was really one of those things the authorities said, Well, best leave it unsolved. " See also Johnny Goodshow Revue; Spinal Tap Sings "(Listen to the) Flower People" and Other Favorites; The Thamesmen.